The waters off La Gomera (Canary Islands) provide almost perfect conditions for cetacean field studies. Only a few miles off the shoreline the Atlantic Ocean reaches depths of 2000 m and more. It is predominantly a pelagic habitat, which is underlined by the presence of some purely pelagic species such as sperm and beaked whales. Bottlenose dolphins, rough-toothed dolphins and pilot whales are resident within the area. Comparable conditions we can find only in very few places around the world. Due to the fact that there are several cetacean species abundant in the same habitat, we can study them comparatively. 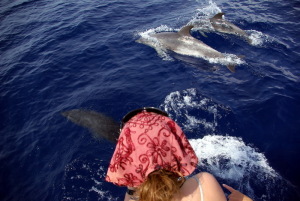 Whales and dolphins have never been hunted in the Canaries and therefore behave relatively unprejudiced towards vessels. Comparable conditions one can find only in few places in the world. The project M.E.E.R. 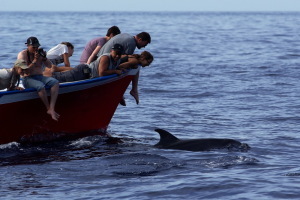 La Gomera is conducting a study on the interactions between cetaceans and whale watching boats since many years. The participants of these 2-weeks practical courses will get an insight into the behavioural research conducted from whale watching boats operating off the island of La Gomera. In this area, 23 cetaceans species could be identified during the last years. The course includes a full training program: the theory and practice of behavioural research will be learned and profound background information on whale watching will be given. Research experience that will be gained includes sighting data recording, behavioural sampling, photo identification and others. Moreover, the research is embedded in conservation efforts aiming at the preservation and promotion of whale watching as a sustainable use of cetaceans and the establishment of a marine sanctuary in the waters off La Gomera. M.E.E.R. La Gomera was honoured in 2001 with the international environmental award “Tourismus und Umwelt”, which is granted since 1987 by the German Association of Travel Agencies and Travel Operators (DRV). As was stated during the bestowal, the project “realises new ways of co-operation of research and tourism in an exemplary and innovative way”. One year membership M.E.E.R. e.V.